Forest ecologists from across the Southwest gathered at the Davis Mountains Preserve, in Jeff Davis County, in June. 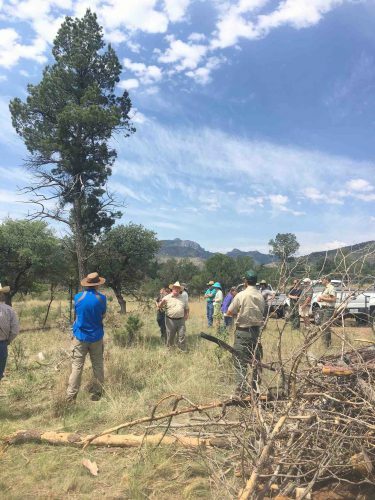 They visited ponderosa restoration sites on the Nature Conservancy’s preserve, and offered input from their work in other forests, as the Conservancy and the Texas Forest Service work to preserve and restore the mountains’ last ponderosa stands. To walk in a forest in West Texas feels like a form of grace. The Davis Mountains are the state’s largest “sky island” – a place of green pastures, a wooded country above a sea of desert. Oak and juniper, aspen and madrone. And on high slopes and canyons, trees that tower above the rest – ponderosa pines. They’re majestic – and a foundation of rich biodiversity. In 2011, Texas had its driest year on record. The drought, and ensuing wildfires and insect attacks, killed more than half the ponderosas in the Davis Mountains. The forest habitat is now at the brink. In spring 2011, fueled by historic drought, wildfires blazed across the Marfa Plain and Davis Mountains, consuming 400,000 acres – and many hundreds of ponderosas. Surviving trees were ravaged by western pine bark beetles. The beetles feed only on weak trees. Stressed by drought, all the Davis Mountains ponderosas were weak. Fifty to 75 percent of ponderosas died after 2011. Jim Houser is a forest ecologist with the Texas A&M Forest Service. At Houser’s urging, the agency made ponderosa restoration a top priority. In 2013, they partnered with the Nature Conservancy. The Conservancy’s 33,000-acre Davis Mountains Preserve includes the mountains’ highest areas, and half the ponderosa habitat. The forest service grew ponderosa seedlings, from cones collected in Fort Davis. Three thousand seedlings have been planted at the preserve. And with grant funds and private donations, the partners undertook a “thinning” project. Ponderosas thrive on cool, north-facing slopes – and especially in watercourses and arroyos, like the Preserve’s Madera Canyon. On 450 acres, contractors cut away thickets of oak and juniper. In these prime bottomlands, ponderosas will now have less competition for water and nutrients. And ponderosa seeds can germinate in the bare soil. Thinning can also reduce the potential for catastrophic wildfire. With thick bark, mature ponderosas can resist low-intensity fire. But when a tree’s crown burns, it’s finished. Livestock grazing has increased the density of woody plants in the mountains. After nearly a century of fire suppression, there’s a lot to burn. Operation Ponderosa has had a rocky journey. Less than a quarter of seedlings have survived. Hungry gophers have been a major culprit. The foresters are seeking ways to exclude them. But there’s a more fundamental challenge: climate change. Ponderosas can go decades without reproducing. From flowering to germination is a three-year process, and seedlings need six years of favorable rainfall to take hold. As temperatures continue to rise, those conditions are likely to become rarer and rarer. Charlotte Reemts is the Conservancy’s research ecologist. The partners are committed to Operation Ponderosa. But Reemts said they will have to periodically reevaluate – to assess whether they’re fighting a losing battle. The partners hope to develop successful restoration techniques – that could then be shared with other landowners. The Davis Mountains are the southern limit of the ponderosa’s range. And West Texans know that having them here is great good fortune. Operation Ponderosa is an effort to help them in their last stand.